Why do Hindus light a lamp at home before the altar of a deity? In every Hindu home a lamp or ‘diya’ is lit daily before a Hindu deity or any symbol associated with Hinduism. 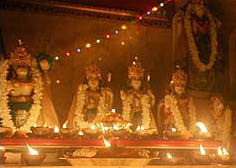 Many Hindus also perform an ‘arati’ with the traditional oil lamp. The lamp is lit in the morning or evening or both morning and evening. In some houses the lamp is maintained continuously and is known Akhand Deep or Akhanda Diya. The light in the lamp symbolizes knowledge. It removes darkness, which symbolizes ignorance. Thus light symbolizes Brahman. The wick in the traditional oil lamp symbolizes ego and the oil or ghee used symbolizes our negative tendencies. When we are lit by self knowledge, the negative tendencies (oil) melt away and finally the ego (wick) perishes. When the ego perishes, we realize that we are all part of Brahman and that life is a continuity. The lighting of ‘diya’ or lamp at home is considered highly auspiciousness as it brings prosperity and good health. The daily evening lamp lit at home also gives us an opportunity to ponder over one’s omissions and commissions in a day.